Several exchange programmes and scholarships are available for senior students who wish to put their German language skills into practice in a German speaking environment. If you would like to find out more, ask Frau Zimmer (Teacher in charge of German). In 2005 Lynfield College established a strong relationship with our German partner school Ernst-Haeckel-Gymnasium in Werder near Berlin. Every two years Lynfield College students travel to Werder for about three weeks to be immersed in the German language. They stay with German families and attend school for one or two periods a day before they go on day trips to explore sights in and around Berlin. Highlights of the trip include visits to the German parliament building (Reichstag), the Brandenburg Gate and Sanssouci Palace in Potsdam. Students learn about Germany’s history and culture from experienced tour guides and they get the opportunity to travel to another part of Germany, for example Bavaria, Saxony or the Black Forest. In recent years groups crossed the border to one of Germany’s neighbours and visited Prague in the Czech Republic and Salzburg in Austria. Upon their return to New Zealand students will have gained more confidence using their German language skills and a greater appreciation of different cultures and their own culture. During the following year Lynfield College students and their families host a group of students and teachers from Werder to return their hospitality and generosity from the year before. This exchange focuses on developing lasting friendships between families half a world away and many students from New Zealand and Germany have travelled back to their host families or keep in regular contact over the years. 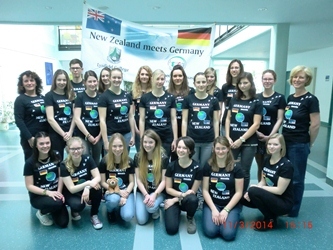 This exchange programme is organised by the “NZ/German Student Exchange” which was established in 1989. Since then some 3550 young New Zealanders and Germans have participated in it, sharing in each other’s culture and, on many occasions developing life-long friendships. The PAD scholarship winners will travel to Germany in the middle of the following year (usually July) and spend four weeks in Germany. Students stay with a German host-family for some of the time, have the opportunity to attend school and get to know the community where they are staying. In addition they will be taken on a tour to other parts of Germany, staying in Youth Hostels. Costs connected with the selection process are covered by ILEP and the Goethe-Institut. Once selected, the German government funds travel, accommodation and some pocket money for the scholarship recipients. New Zealand students stay with families in Germany for approximately ten weeks from the end of November to early February (during their summer holidays) while the German partners stay in New Zealand from June to August the following year. Students attend school in the respective countries. Scholarship winners are provided with return tickets to Germany and insurance cover. Welcome to our visitors from Werder/Germany! On Saturday, a group of German language students and their families welcomed 17 students and two teachers from our partner school Ernst-Haeckel-Gymnasium. Most of the Lynfield College students stayed with the visiting students last year so there was huge excitement to see their friends again. The German group will be staying for three and a half weeks visiting Lynfield College and exploring Auckland and parts of the North Island. Since the start of the German Exchange programme in 2005 more than 200 students have travelled to the other side of the world to be immersed in another culture and language. International student exchanges are amongst the most valuable experiences for young people: An exposure to a different culture, to a new linguistic environment and to new social values represents a challenge which most participants cherish for the rest of their lives. 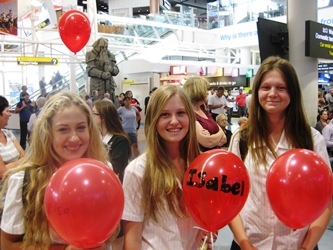 On the 28th of April 2015, 18 students and two teachers met at Auckland International airport ready to embark on the trip of a lifetime to Germany. Many of us were nervous as this was the first time we would be away from our families and friends for such a long period of time. After more than 30 hours of travelling including a 12 hour stopover in Frankfurt we arrived in Berlin and met our host families that we would be staying with for the time we were in Germany. Our exchange partners all attend our partner school Ernst Haeckel Gymnasium in Werder, which is a small town half an hour's train ride from Berlin. We were to spend the next 3 and a half weeks living with our families learning about and immersing ourselves into their culture and families. Every morning our group would meet in the foyer of the school and walk to the train station and catch a train to what the day's activities were. We spent most of our time in Berlin exploring the landmarks the city has, such as the Reichstag, the Brandenburg Gate, the Holocaust Memorial, the Berlin Wall, the East Side gallery and plenty more. We also had free time nearly every day where we could wander the streets or a mall in small groups and shop or eat. We also attended some classes with our students, which was very different because they have 1.5 hour classes four times a day and 12+ different subjects. School in Germany is much harder than school in New Zealand (the teachers read your marks out in front of the entire class). Our weekends were spent with our families, so everyone in the group did different things, for example going to the Baltic Sea or Poland. Our group spent five days in the Black Forest in the south of Germany, which was a 12 hour bus ride from Werder to there. For many of us it was the first time seeing proper snow, even though they told us it would be warmer in the South. We spent the 5 days at a youth hostel that was over 300 years old. We spent a day in Freiburg, a city close to where we were staying and we went to an open air museum and the longest luge in Europe (which was more like a one person rollercoaster). We also drove to France and spent the day in a city called Colmar (where some people ate snails). We all found it strange being able to drive from one country to another and spend the day there. Colmar was very similar to Germany apart from the fact that everyone spoke French. The extend of our French was extremely limited (2 sentences max.) and so we all struggled through asking directions in a mix of English and German , thankfully some people spoke German so we didn’t get too lost. At the youth hostel we sang the New Zealand national anthem for the family that ran it, in practice for our upcoming performance at the farewell dinner. Thankfully it went well, compared to our practices back home. When we got home from our five days in the Black Forest we had another week and a half with our families before it was time to go home. By this point we were pretty used to everyone around us speaking German, and our language skills were improving because of the constant use of German around us. Though sometimes it still caught us off guard. I was asked if I wanted a receipt at the Supermarket and had no idea what the guy was asking so I just awkwardly said nein hoping it wasn’t something important. We spent another week travelling to and from Berlin seeing the sights and bonding with the group and our host families before the time came of the farewell party. We had all prepared a speech for our families to thank them for taking care of us which most of us got through without crying. We had pictures of our time in Germany playing on a screen and we all danced the Anna Marie dance. It was a sad night because we knew we would be leaving soon and that we wouldn’t see our partners for a year, if at all. On the last day we went to the Zoo and a 2km shopping street (where we spent too much money). And then it was time to leave. We all woke up in time to get to the airport at 5am. There was a sombre mood over the group as everyone would have liked to stay and not go back to school. After lots of tears and hugs we walked through the gate and boarded our plane. It was such a fantastic experience for all of us and we all learnt so much about German life and their culture and customs. We all look forward to seeing our German brothers and sisters next year when they come to New Zealand. A group of German language students and their families welcomed 20 students and two teachers from our partner school Ernst-Haeckel-Gymnasium. Most of the Lynfield College students stayed with the visiting students last year so there was huge excitement to see their friends again. 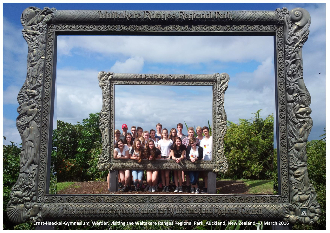 The German group stayed for 3 weeks visiting Lynfield College and exploring Auckland and parts of the North Island. Since the start of the German Exchange Programme in 2005 more than 180 students have travelled to the other side of the world to be immersed in another culture and language. 2013 - Trip to Germany - brilliant! 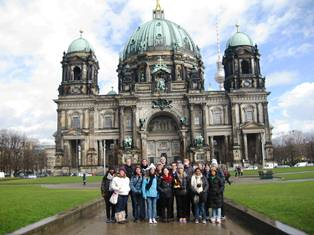 In April, a group of 16 German language students together with Frau Zimmer and Frau Delgrosso went on an educational exchange to Germany for four weeks. We stayed with host families from our partner school, Ernst-Haeckel Gymnasium in Werder, 35 km from Berlin. We spent time individually with our families and we all gained our own experiences of the German lifestyle and culture. We went to school each morning and attended a class - it was extremely interesting for us – imagine biology or calculus in German! After the class our group would meet and then travel by train to our destination for that day. We visited countless famous landmarks and historical places and we were very grateful for our English-speaking tour guides. Every day was an eye-opening history lesson. Each afternoon we had a chance to really test our language skills during our free time. We ordered food in German, asked for directions, went shopping and had to learn what questions like “would you like a bag?" were, but we got the hang of speaking German (outside of our classroom in Lynfield ) eventually. In the middle week the group travelled to Dresden. We stayed in a youth hostel, with a brutal history, in a small town called Hohnstein. The youth hostel, previously a fortress, a prison and court, and a prisoner of war camp, was built in the early 1200s. Our group travelled on a bus into the Czech Republic to Prague for a day trip; the atmosphere of the country was noticeably different from that of Germany. In the youth hostel we started preparing for our farewell party. During the last week in Werder the tree blossom festival took place. It is the second largest festival in Germany, after Oktoberfest, and it celebrates the spring fruit tree blossoms. At our farewell party we all gave a speech in German to the families and teachers, we also sang the national anthem and the Maori song “Te Waka”. The German students also gave speeches and sang. At the airport it was a very emotional and hard good bye for us all and many gifts were exchanged. Frau Zimmer told me to stop crying and that if I don’t leave I can’t come back. The exchange was very educational and we all gained many things from it. We now look forward to welcoming 20 students from our partner school next year and can’t wait to repay their generosity and hospitality. 2010 was Lynfield’s turn to host our partner school from Werder, Germany. We definitely enjoyed showing our school and country to our German friends. 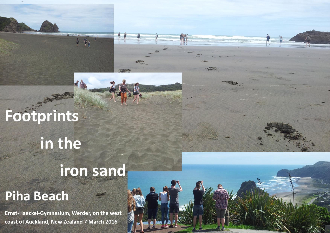 The first week was spent around college and special local sights such as Arataki, Piha and the city. A day’s trip to surf at Mt Maunganui and see the beautiful Coromandel peninsula was a special treat for teenagers who rarely see much seaside. 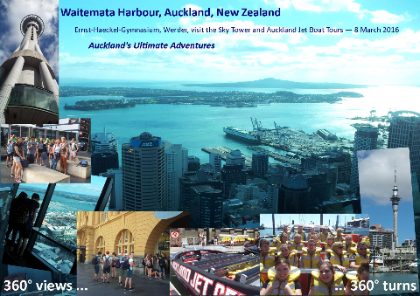 A week long trip around Taupo, Rotorua and Tongariro National Park tested our visitor’ nerves as bungy-jumping and white/black water rafting were optional experiences! 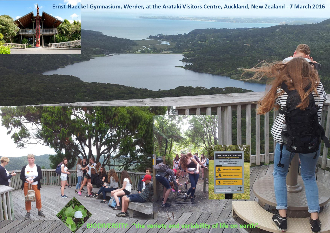 In the last part of the three-week visit, riding horses along Pakiri Beach, visiting the wildlife on Tiritiri Matangi and trekking to the summit of Rangitoto ensured the German students were exposed to many activities that were new to them. Lynfield thoroughly enjoyed showcasing our beautiful country to our German counterparts. 2011 will see a return visit with Lynfield staff and students once more travelling to Germany. We have created a blog on which to record our experiences and hope you will follow us on our trip.